I am not even going to apologize for my extended blog absence. It is my blog after all. But I have been working on a very VERY important project that has been keeping me exceedingly busy and not doing much sewing, crafting or jewelry making since February. Once the project is complete in early November, I will be even busier. Yes, for those of you who worked it out, there is a baby on the way! The first three months sucked (as they do apparently), but once the nausea wore off, I have been crocheting wash cloths, working on one of those baby announcement cross-stitch kits and I have made a top and a couple of pairs of draw-string shorts. I had all these glorious visions of making my own maternity outfits and sewing for the baby, but that was before I realized just how much work it is to assemble one of these mini-humans! I don’t think I have ever been so tired in my life! So I have admittedly bought the majority of my maternity wear except for what my amazing mum has been whipping up in her sewing room for baby and I, including a dress for an up coming wedding, tops, pants and lots of crib sheets, receiving blankets and fuzzy sleepers. The one big sewing project I have embarked on is a set of curtains for the baby’s room. I got some cute fabric with birds on it, the black out lining and was ready to go. I got them cut out (which took an extraordinary amount of effort), got the first hem on the first panel done and then attempted to attach the lining. Let us just say that it is a good thing that, though baby can hear me, they can’t discern actual words, or they would be born dropping the f-bomb. I hated everything about the panel, it was impossible to iron, the hems were bulky despite my best efforts and I am fairly sure totally crooked. So after letting it hang up on the rod in the nursery and infuriate me for a while, I took it down, ripped out the lining and will just make the plain curtain panels and install a separate roller blind. You gotta pick your battles! So, once those are up, I shall try to remember to update you all with some photo’s, but since embarking on the journey to motherhood, my brain seems to resemble a sieve! I left a pair of socks in the pantry…yeah. Well folks, the summer is over and so is my vacation and my slow down, things are now moving apace! Since I last posted, I have finished a few aprons, a pair of pants, and a tunic. I made out like a bandit at the McCalls $.99 out of print clearance sale. 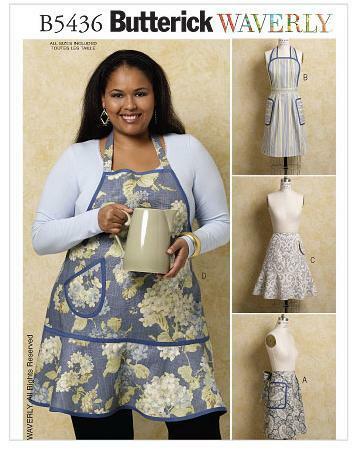 I bought about 15 patterns, some for me and some for my niece and some for aprons to make for sale. 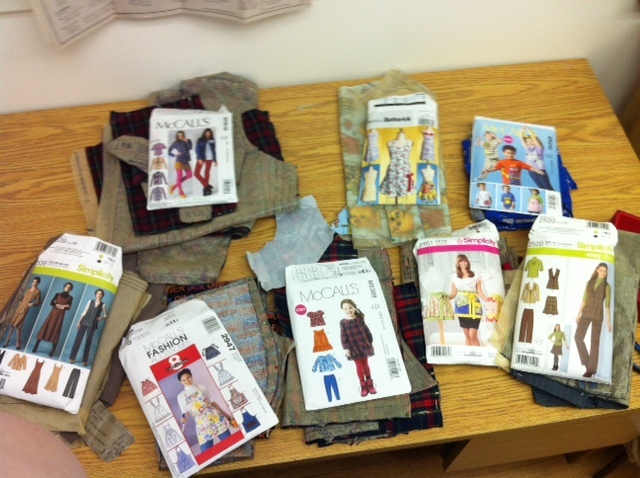 I also cut out a number of items which I am going to start sewing this week. 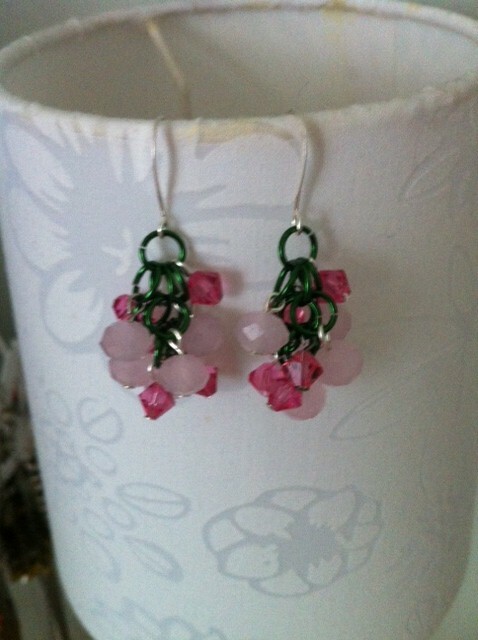 I started designing for WM Bridal, the new line I am going to add to my Etsy shop. 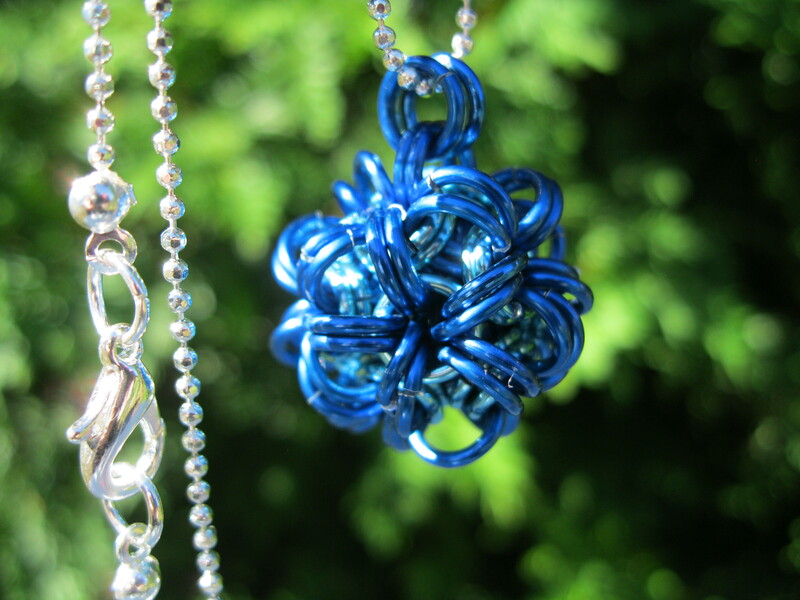 I registered for 2 craft shows this November at the Ottawa RA Centre in the Clark Room on November 16th and 30th. 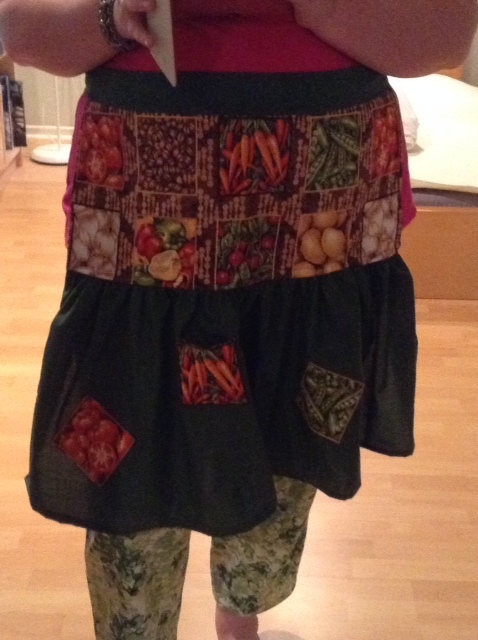 Here are the aprons I have made so far. Now, as you can see, what I created is completely difference from what it is supposed to look like. 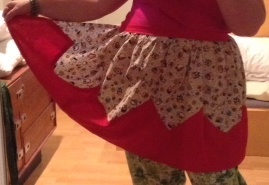 This is because the scalloped edge came out looking horrible! So after cutting off the scalloped bit, I didn’t have a very big piece left so I took the accent green and created a gathered skirt-like piece with patches from the main fabric. The carrot patch is a secret pocket. The other two when MUCH better! 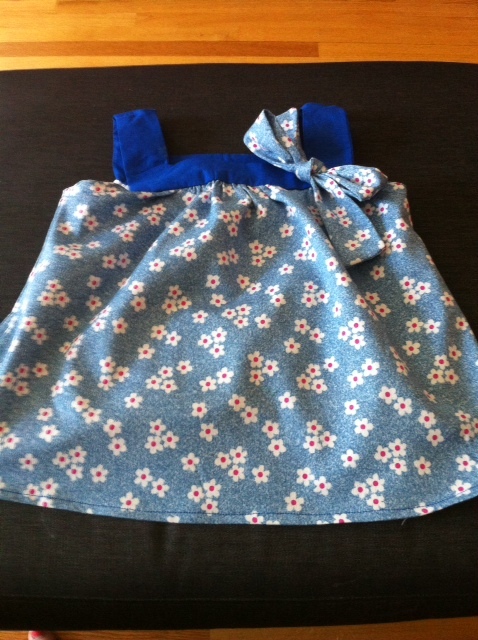 This one is cute, I used some sheer lacy fabric for the flounce and the ties at the back. 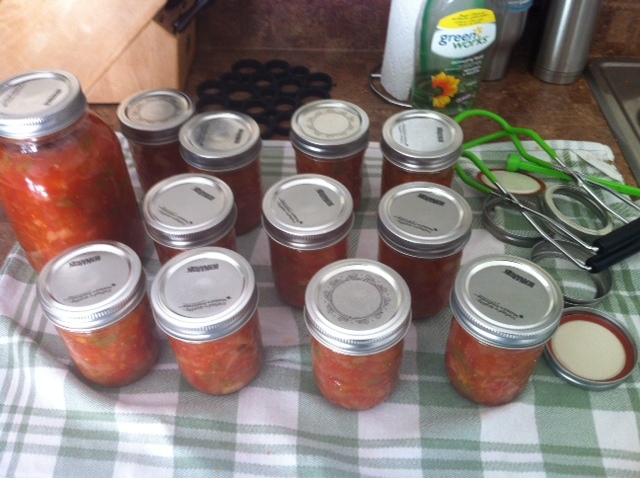 and I am pretty happy with the results. 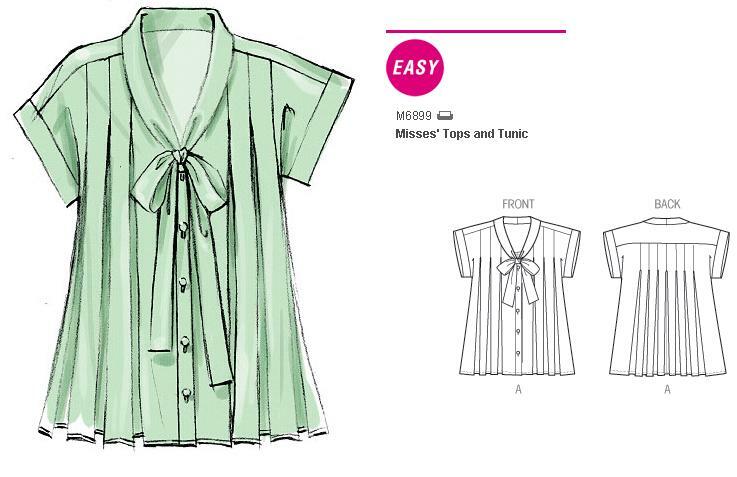 I can see trying the other versions on this pattern. This one is my favourite! It is hard to see in the picture, but the fabric is little owls, with red linen accents. 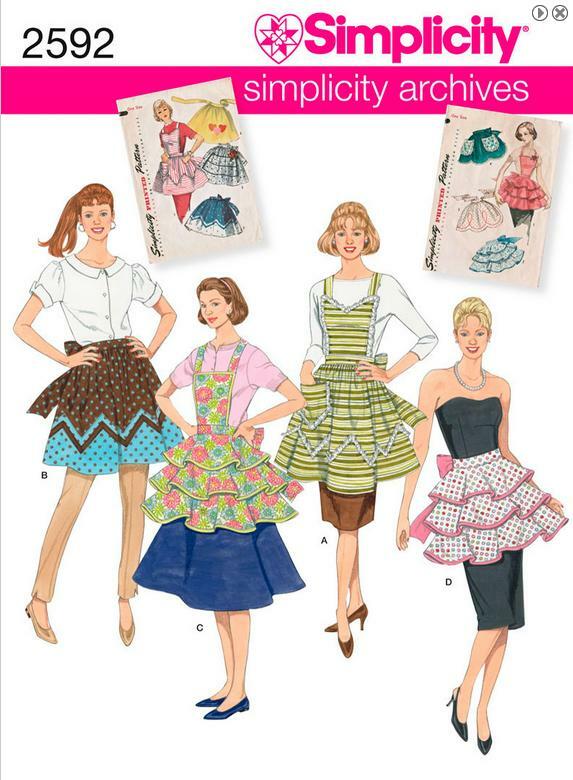 The pattern is a retro one either from Vogue or Butterick, I can’t remember, (I will add the info later when I find the pattern). Simplicity Archives 2592! View B. I want to try View C next! Those are the projects I have actually completed in the last month or so. 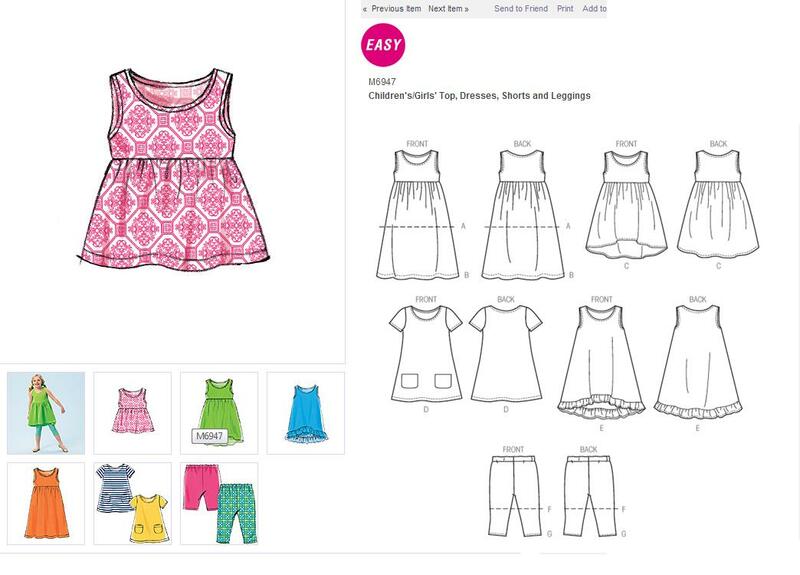 Here is what I have cut out that I am going to start sewing this week! 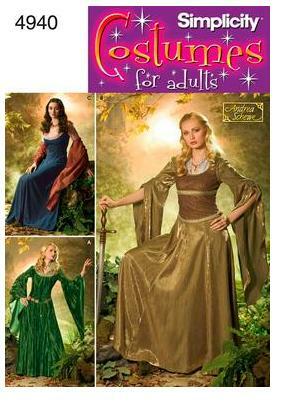 I can’t decide between the Arwen dress and the Eowyn dress. 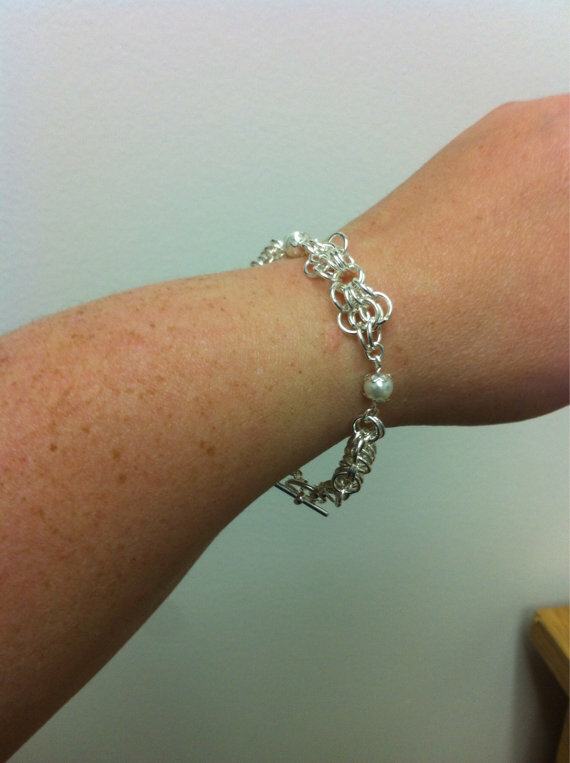 Now for the Jewelry items. I haven’t been as busy with this as with the sewing. 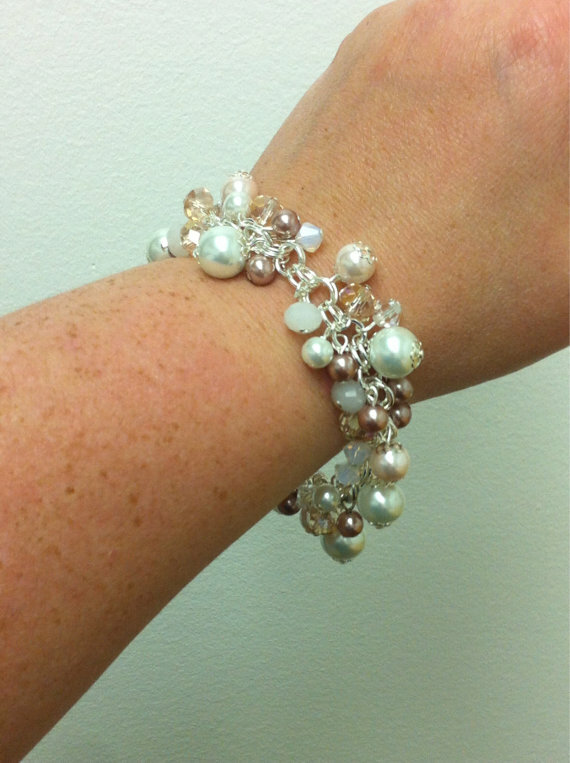 I have started developing some items for what I am calling WM Bridal. 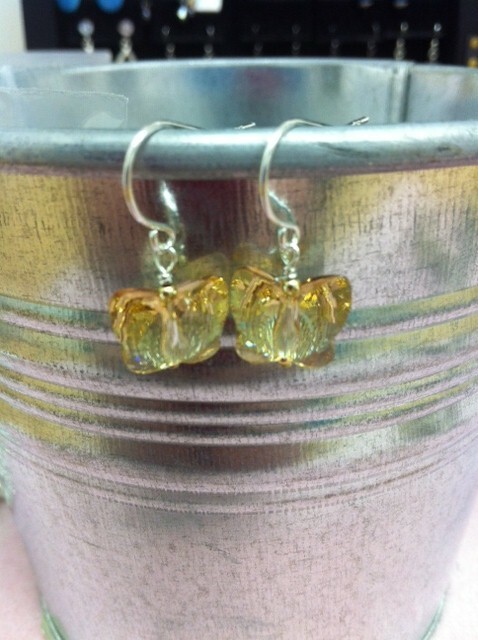 I started working with some sterling silver and fine crystal for some items, but also with silver plate and glass for bridal on a budget. My own bridal set was silver plate and crystal. Here is what I have come up with so far. I would love some feedback, items that you like, and things that maybe could be better, or things you would like to see. I also did a really neat up-cycled necklace out of different chains that I got from my Uncle whose father had owned a jewelry store, combined with beads that I salvaged from some old costume jewelry my Aunt gave me from her theatre group that wasn’t being used. Well, I think that might be it for now. I have lots of work to do this fall. I can’t wait! I haven’t done all that much crafting or sewing lately, and who can blame me. The weather has been wonderful, we have been spending our weekends working outside, redoing the deck, hanging out on a friends boat and watching the World Cup. I also forgot to add photos of my completed items from the previous post. oops. I haven’t been completely idle in the craft department of course, I completed the mult-imeter case for my DH, and that was quite a challenge! So the multi-meter is a hand-held device about the size of a large paperback novel, and has a number of attachments for measuring temperature and electrical current. 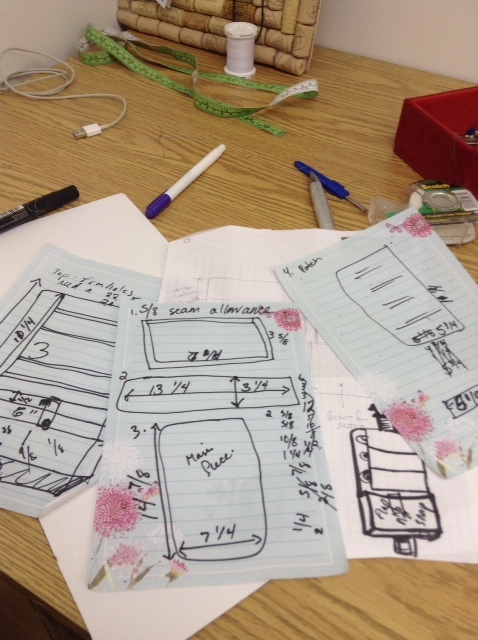 The first thing I had to do was to take all the necessary measurements, and then come up with a pattern that would work. I spent a lot of time mulling it over before I applied scissors to fabric! 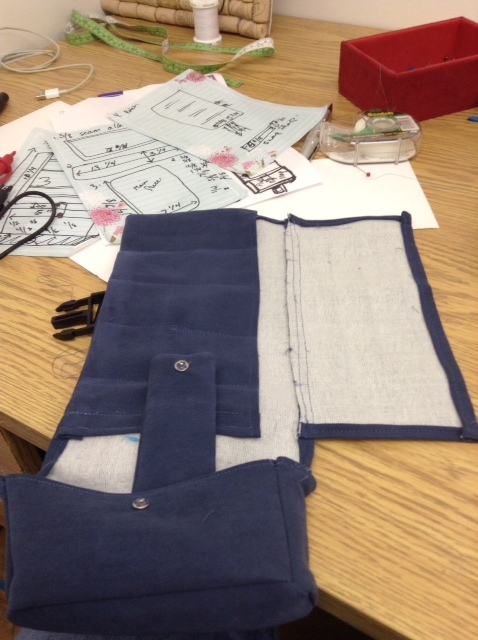 The original design my DH and I came up with was to basically fold over a piece of the fabric and sew in a number of pockets, but once I sat down with the device and the fabric, I realized that it wouldn’t work because of the depth of the device, about 3″. So I needed to rethink the entire thing, and this is what I came up with. A deep pocket for the device at the bottom of the case, and then a long flap above it with pockets for the attachments. It has been a LONG time since I have had to add fractions together, but I had to do quite a bit of that for this! I needed to make sure my seam allowances were included in my measurements. The first issue I ran into was trying to get the device pocket to go together. it had a front piece, a side piece to give it depth and these went together onto the main back piece. Sewing curves is never easy and trying to do it with a thick and stiff fabric, was not going to work. So the long side piece had to be re-cut as three pieces. I had to trim a lot of the seam allowance off so that it would fold in nicely. The rest when together fairly easily. I even included a flap with a snap to hold the device in. 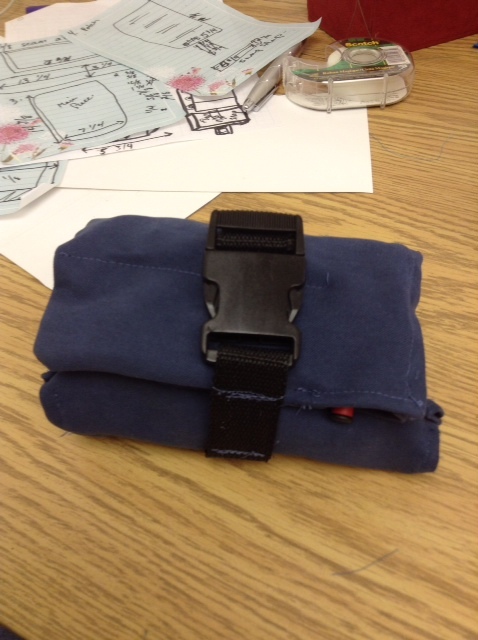 The attachment pockets went in quickly and I decided to put a flap over them so that they wouldn’t slide out. Once that was finished I was able to install the strap and clip closure. My DH is quite happy with the results. I spent a lot of yesterday in my craft room as well, most of the time spent sorting through all my amazing stash of old jewellery that my aunt brought me, and planning some cool upcycling projects! I have plans for making x-mas ornaments from old ornate brooches! I have fairly large hands, and the kinds of bangles you can buy in cheap accessory shops don’t generally go over my hands easily or comfortably. I have a ton of them anyways of course. 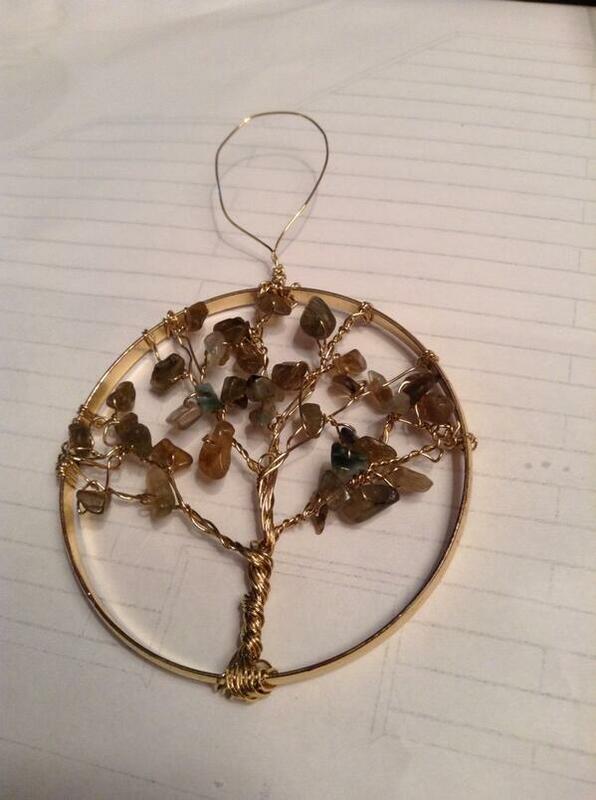 So the first thing I made was a wire wrap tree, with gold plate wire and labradorite chips, using a gold bangle as a frame. I can see myself making more of these! 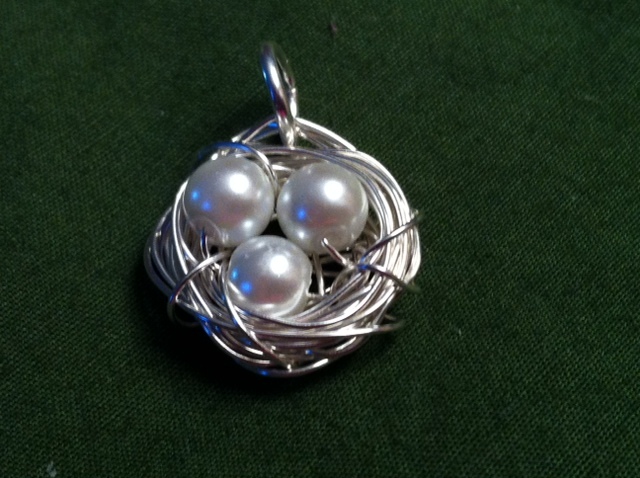 I also made an abstract one with various white beads as well. That is it for now, folks. It was the first weekend in a while that my DH and I didn’t have a lot of plans, so we got to devote our time to our various crafty pursuits. For me of course it meant spending every possible moment in my craft room. When I got home from work on Friday I set to work on some seriously cute stuff for my niece Charlotte. I made View A, the shorter top and view G, the leggings. Both in the same hot pink knit that I made that tank top out of for me. My machine does NOT like that fabric! My thread broke continually throughout the project, but I did finish it in the end. 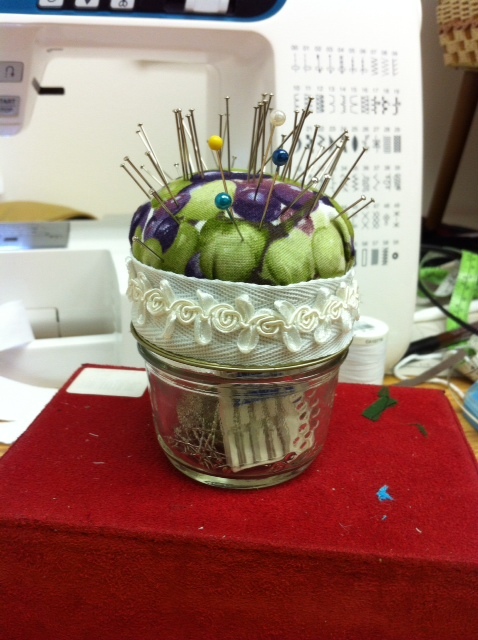 I added three little white flower buttons on the top for decoration. I didn’t know this place even existed, but on Saturday after we popped in to visit my father-in-law so my DH could use his table saw, my DH took me to this place called Rockland Textiles. They carried every shade of Gütermann thread available so I was able to get the green and red I need for my skirt and pants projects. I also found a bunch of fun quilting fabric to make aprons for my next craft show. We also found fabric for me to use for my DH’s multimeter case. So I texted my mom to say, “did you know about this place?” Not only did she know about it, apparently while we lived in Ottawa she used to work there on Saturdays and most of the fabric that made up my early childhood clothing came from there! Who knew? I used an adorable printed knit that is blue with white flowers with hot pink middles. It goes with the hot pink leggings perfectly. It was a more challenging pattern than I have done before, but I really like how it came out! When we were at my Sister-in-laws house yesterday for a Father’s Day BBQ, I tried everything on Charlotte. The hot pink tunic is a bit big, but she can grow into it. The leggings fit quite nicely. 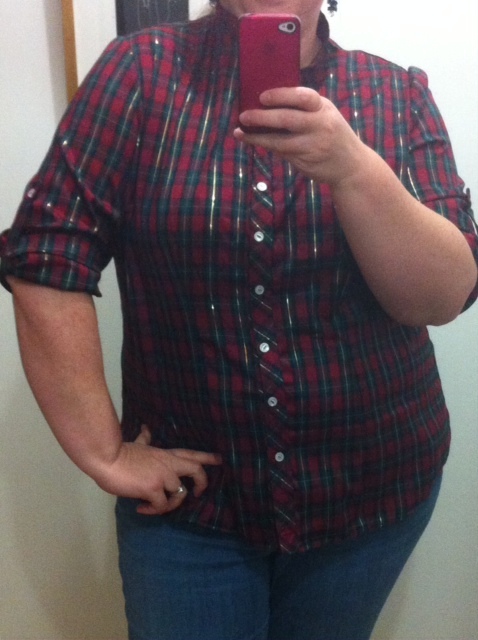 The blue top unfortunately is to big in the shoulders so it hangs down too low. I thought I could just take it in at the shoulders, but then it would be difficult to get it onto her. So I gave it a lot of thought throughout the evening, and I figured out what I will do. 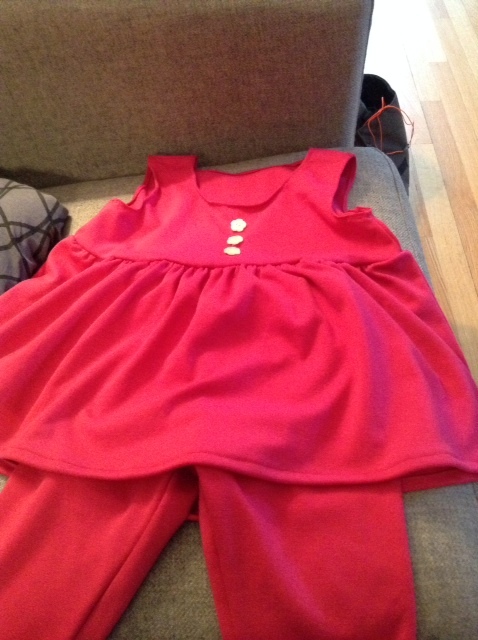 I will unpick the shoulder seams, and refinish them open, then put a button-hole on the front side, and next time I see my niece I will add the buttons to the back so that it is easy for her mum to get it on and off and it still fits properly. Now, don’t think I ignored my own needs during all this. My Aunt also gave me some great Hawaiian print of green leaves and pink flowers, that I think had been either a skirt or curtains or something in a previous life. 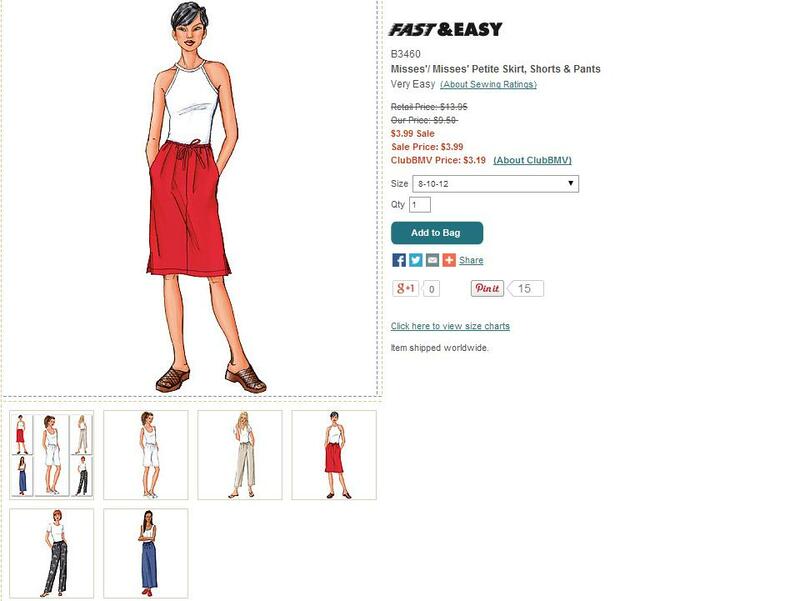 At any rate, the fabric is lovely and soft, so I thought I would use it to make http://mccallpattern.mccall.com/m6927-products-48273.php?page_id=101, which my mum had helped me to adjust for my fit when she was visiting last. It is a great pattern! It is super easy to adjust to the size you want, and includes different pattern pieces for different cup sizes, so that the darts are the right fit. The pattern only goes to a 24, but I added an inch on each side from the waist to the hips to make a 28, I cut a 20 in the neck, a 22 in the shoulders and armholes, but moved from a 22 at the top of the armhole to a 24 at the bottom. I will absolutely be using this pattern again. I love the way it is finished too. 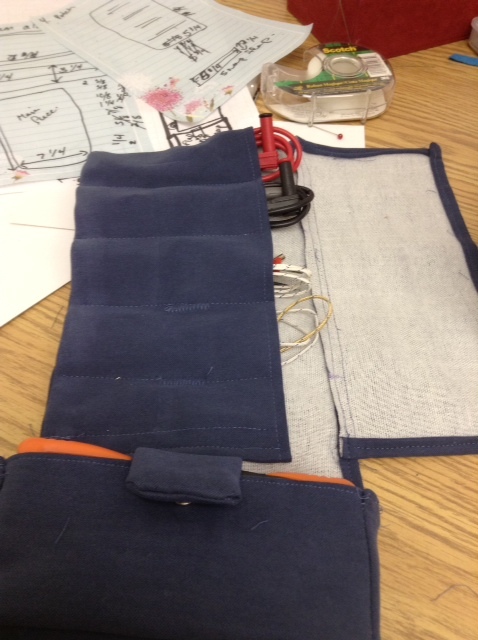 The back is closed with a button and thread loop. Fortunately I had a button that worked in my collection, but I had to look up how to make a thread loop on YouTube. It’s fiddly. 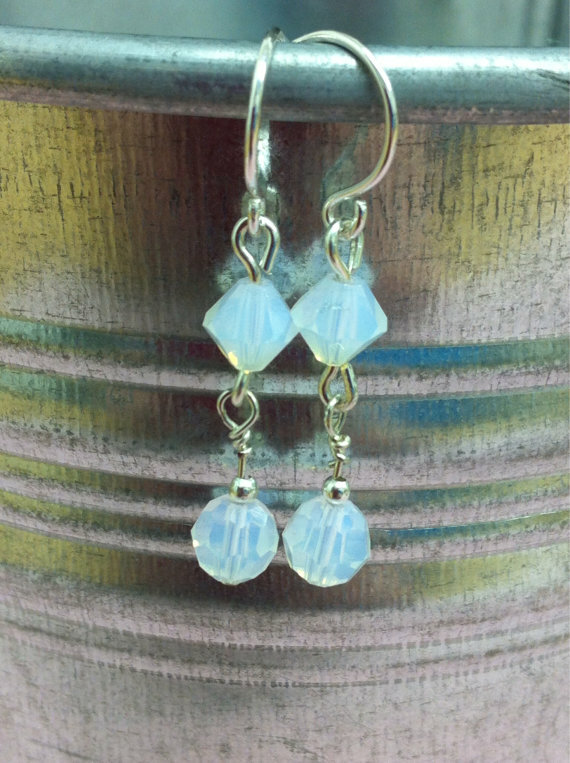 So I decided to wear it on Sunday for the BBQ, and because it’s me, I decided that I needed a pair of earrings to match. Sewing class, under-stitching and surgery. 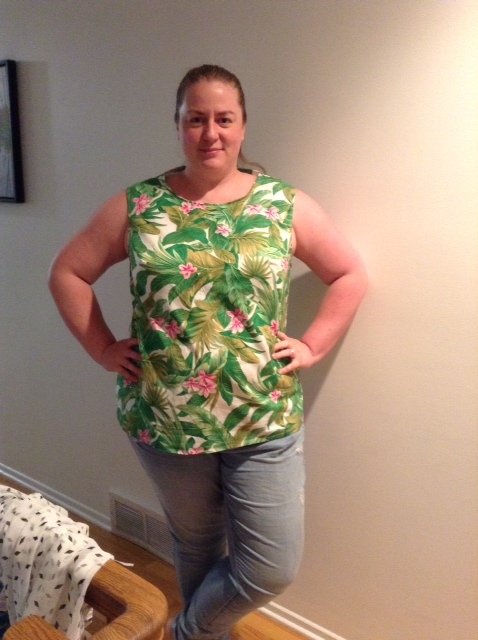 I just got in from my second to last sewing class and it was a busy one! 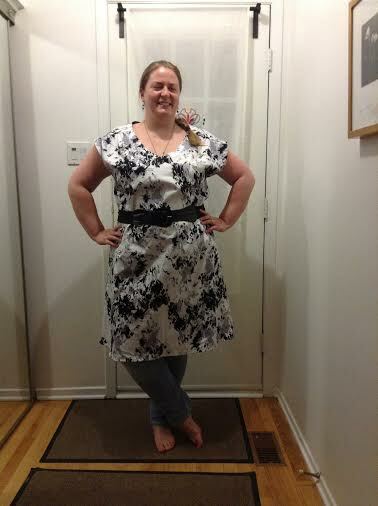 I was ready to put the finishing touches on my black and white dress for Simplicity 3506. All that I needed to do was add the facings in the neck, finish the arm-holes and the hem. Of course, things never go as smoothly as one would wish. First off, I had somehow left the bobbin cover to the machine at home, which meant that I had to tape a piece of cardboard over the hole. Not an auspicious start. The machine ran along smoothly though. I ironed the interfacing onto the facing pieces and that went OK. I pinned the facing in and that went OK too, so I sewed it in and pressed the facing down and then did what I thought the teacher meant by under-stitching. I thought it meant that I put in a row of stitching close to the edge through all three layers, fabric, facing and seam allowance…nope. What I was supposed to do was put a row of stitching at the edge of just the seam allowance and the facing. crap. So I added a second row of top -stitching so that it looks decorative. I wasn’t about to unpick all that! So then I zipped up the zipper…double crap. Somehow, one side of the zipper was half an inch higher than the other. I guess I had pinned it in wrong and so the top of the zipper hadn’t folded properly. So I had to unpick that side back a few inches, re-fold it so it matched the other side and re-sew it. Thankfully, that turned out pretty well. Now for the surgery part of the class. As I was happily overcasting my seams, on the sides, my brand new machine started to slow down and then grind to a halt. I tried to re-thread, checked under my make-shift bobbin cover. Tried turning it off and on again. Now even the manual wheel was stiff. Something was VERY wrong. So I decided to open it up, and once I figured out how to do that, I found that a large amount of pink thread had wound itself around a wheel in the arm of the machine that feeds the thread. This was the result of the thread breaking so many times while I worked on the pink tank top. So I carefully picked and pulled the wad of thread out and reassembled. 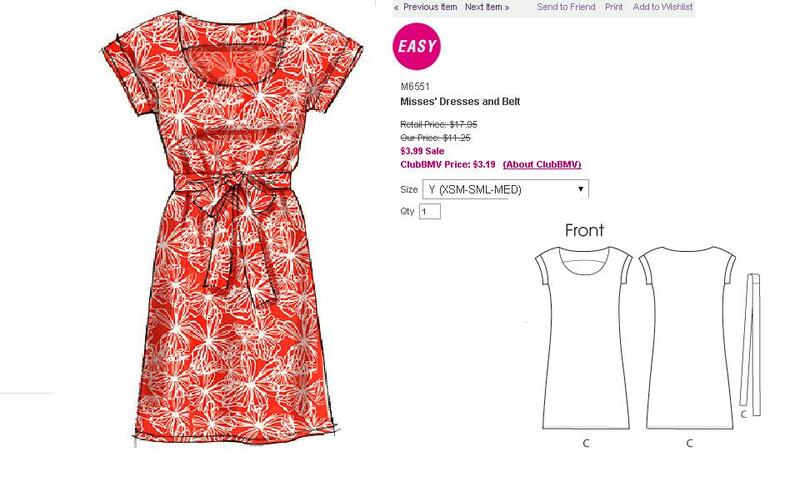 THANKFULLY, the patient made a full recovery and I finished the dress! Even having cut a 22 in the top, it is still a bit big. I think I will cut a 20 on my next project.